Would an iPhone survive the apocalypse? The release of Mad Max: Fury Road earlier this year pushed George Miller's name right up to the top of the action director pile. 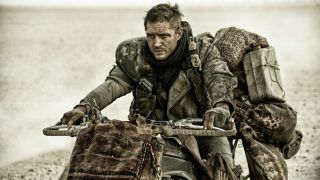 The movie, a quasi-sequel to Miller's Mad Max trilogy, is the most refreshing piece of action cinema in years. The reason: all the sequences were shot in-camera, not in front of a green screen - something that made complete sense to the director. "We didn't use CG because we don't defy the laws of gravity [in the movie]," says Miller. "There's no flying people or space vehicles, no alien planets. This is a real world, it's crazy to do it CG when you can do it for real. You want the world to be authentic, to be immersive." This isn't to say that Miller decided to shy away from new technology making the movie, he just used it sparingly, sprinkling CG when needed, and relied more on the intimacy a digital camera can offer compared to shooting with film. "We decided to go old school but still using the agility of the digital cameras and still using CG to keep a consistent sky," explains Miller. "The storm scene you couldn't do for real so it was good for that. And we could erase harnesses that keep the actors and the stunt crew safe, you can erase the evidence of previous takes with the tire marks and so on." All of this is a far cry from how the original Mad Max was shot back in 1979. Not only was the budget and crew bigger, but Miller believes that in the last 35 years the way we 'read' a movie has changed too, and this had a fundamental effect on how Fury Road was shot and edited. "Moviemaking has changed in so many ways. The world has changed, cinema has changed, the way we read film has changed rapidly," says Miller. "Mad Max 2 had 1,200 shots, Fury Road has closer to 3,000." "Jurassic Park, I was told, had 950 shots and the latest one probably has three times as many. So we are reading movies faster and faster." The improvements in cameras also meant that Miller could get closer to the action without actually having to be there which was a relief on a movie that doesn't really have a moment where something wasn't on fire. "If you have a big explosion you don't need to be worried about getting your crew out of there, you just turn the thing on make sure it is running and dawdle off and you still have 20 minutes before the event," notes Miller. To make sure that he utilised the cameras he had and didn't miss a shot, Miller also built something that could have rivalled any of the modded cars in the film - the Edge Arm. "It was basically a very sophisticated crane mounted on a vehicle, run by the 'three headed beasts' - three men on toggle switches, one of them was a great stunt driver and you could put that camera anywhere," says Miller. "I am sitting there as the director watching the screen in the middle of a fierce 'video game'. I never dreamed we could do that. It was black, it was a very heroic looking thing. Quite often it was in our shots, so we left a couple that had its shadow in, just as a little homage to it." It wasn't just on the ground where Miller used new technology, he took to the air too - bringing in drones to map out the Mad Max world. Interestingly, technology has moved so fast that legislation meant he wasn't allowed to use drones during the shooting of the movie because of insurance issues - he had to be clever with the way he used them. "We used drones to photograph and map the landscape, so when we needed an extra bit of mountain, we could take the mountain we had and the time of day, the exact positioning with GPS and basically recreate that mountain digitally if we needed to [with drone footage]. We could even erase tire tracks and have pristine ground and the exact lighting." All this new-fangled technology is great for shooting the movie but would any of it actually survive in a Mad Max apocalyptic world? According to Miller, it's highly unlikely - it's actually the older, more mechanical stuff that survives in his movies and for good reason. "Everything found in the movie had to have a very rigorous logic. The film is very helter skelter, but there is a strong internal logic that underpins a film that is just chaotic and random. "Every design of wardrobe, weapons, cars, had to work to the same logic which is basically everything is repurposed, the cars that would survive an apocalypse are earlier technology, no microprocessors, no crumple technology, airbags. They are robust cars. "The big problem with something like a Tesla is the computers would let them down, they had no way to repair the computers. So it was simpler technology that survived." But what about the iPhone - surely Apple has made something robust enough to survive an apocalypse? "I dropped my iPhone, believe it or not, in the toilet and I had separation anxiety for the three days it took me to recover the material on it and so on. So, it definitely would not survive," he says, laughing. "We talked a lot about that for timing and I'm afraid no computer would have survived." Mad Max: Fury Road is out on Blu-ray Monday October 5.